This Japanese-inspired salad is my absolute favorite sushi restaurant appetizer. Make it at home with the recipe for this quick and easy recipe! First peel the skin from your cucumber. Next, use a spiral slicer or a vegetable peeler to turn that super refreshing veggie into even more refreshing noodles. Drizzle the noodles very lightly with rice vinegar. You can skip this step if you're not a fan of vinegar or acidity; I've had the dish both ways and find it delightful regardless. Next, use a fork or your fingers to shred the crab. Combine with mayo and sriracha and set atop the noodles. 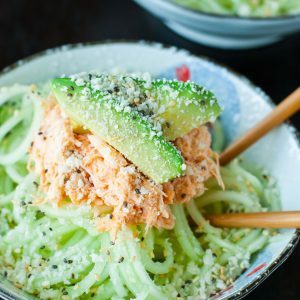 Top with sliced avocado. I added extra after the photo was snapped; helloooo healthy fats. Sprinkle avocado with a teeny pinch of salt to season. Garnish with sesame/chia seeds and optional panko and dig in! If paleo or gluten-free simply skip the optional panko topping.